Have you ever embarked on travel, or a day, only to be met by a series of small, mostly insignificant indicators that plans will not unfold as intended? 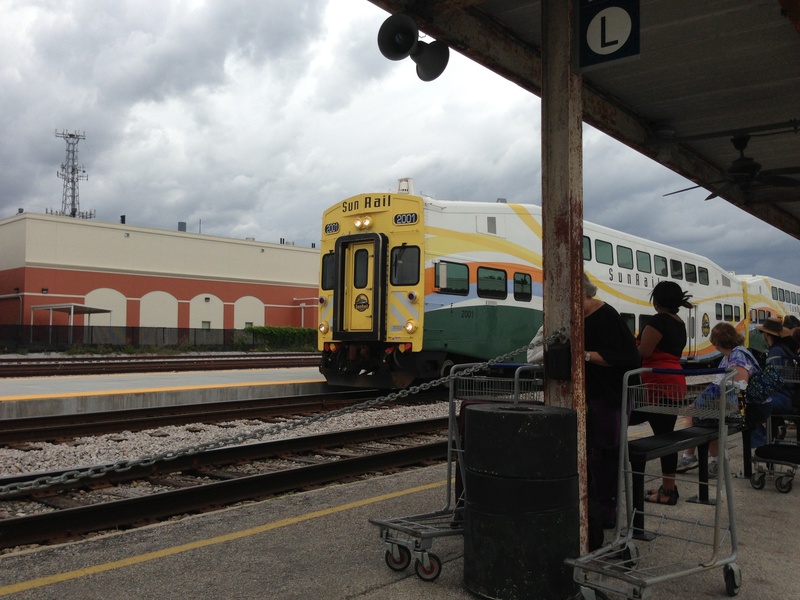 The first hint came as we pulled up to the Orlando train station, which is of a vintage that afforded an appealing design. Even as we were exiting the car, though, we were greeted, as it were, in the parking lot by a man whose belongings suggested that he spent much of his time on the streets, rather than having the luxury of fussing over train misadventures. Even as our driver strongly discouraged us from giving the man any cash, he aggressively approached us for money. We made our way inside the compact and distinctly whiffy station, where we were told without the blink of an eye that the train was delayed by 35 minutes. All right. With more than an hour and a half to spare, it was back to fresh air and over to the luggage drop-off for us. Here, in contrast, we met with friendly service; this employee was very helpful and offered the suggestion that we might want to try one of the two or three small businesses across the street to kill time and enjoy some light refreshments. Luggage-free, we crossed paths again with the fellow we’d first met on arrival. Or, rather, he followed us across the street, becoming louder and even more vociferous with each step. As we reached the doorway of Lucy Bleuz, which turned out to be a great little cafe, he yelled out his doubts about someone’s masculinity and then crossed back to the lawn of the train station, which he promptly used as his own open air toilet. Lucy Bleuz marked the high point of our travel day. The atmosphere inside Lucy Bleuz was a welcome reprieve; the host was gracious and efficient, and the food and music were appealing. Here, in old Orlando, we were a world away from the manufactured perfection of the convention district, and learned about imminent work on gentrification of the street. We later learned that the train station is in the immediate vicinity of what is increasingly becoming a centre for medical facilities and services. I suspect that all this gentrification will enhance travellers’ experiences, with the double edged sword that it may further disadvantage or dislocate any street people who could benefit – as can those in our city – from health services, food and shelter. We could loiter over a light lunch and refreshing lemonade only so long without overstaying our welcome, though, and so it was back to the train station and an outdoor bench along the track for us. When the train did pull in, there was a change in plans and all the Miami-bound travellers were directed to the far end of the track, to cross over the rails and board the train from the other side. We quickly abandoned the seats assigned us, given the garbage left behind by previous passengers. That was just as well since, as a nearby traveller told us, those seats had been occupied all the way from NYC by an Orlando-and theme park-bound family, the youngest of whom had unfortunately left his most recent meal on the floor in front of the seat. 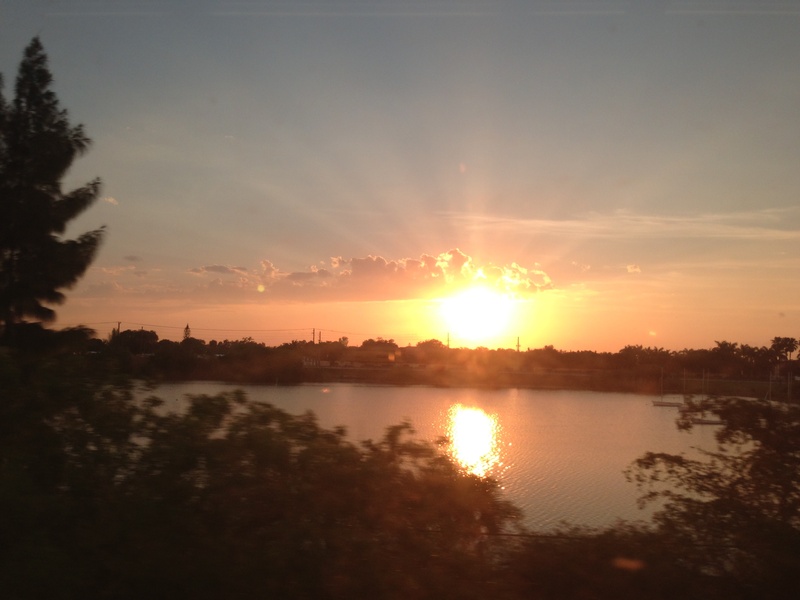 I digress, though; not long after, the train began rolling southward, and we settled in for a pleasant ride – only to receive a rude awakening on arriving in Miami at dusk, at one of two train stations in that fine city. Mea culpa; I’d neglected to do my homework on the area. It turned out that some cabbies are less than enthusiastic about cruising over to this particular train station after dark. The savvy travellers among us who’d not checked their luggage strolled off the train and directly into the half dozen or so cabs that were station-side. When those of us who had checked our luggage emerged from the station moments later, though, we were met by an empty roadway and no sign of transportation. I popped back into the station, asked the luggage attendant to call for 10 or so cabs, and returned outdoors to wait. Roughly 30 minutes after arriving in Orlando, with no cab in sight, I asked the staffer about public transit options and she helpfully offered some options that involved a couple of transfers and, unfortunately, what sounded like another 40 or 50 minutes of travel with suitcases in tow. I phoned our hotel, and was grateful for advice against people who were transparently touristas hopping onto a bus in the dark in this particular neighbourhood. All right. By now on very good terms with the hardworking and friendly young train station employee, I asked for and received the phone number of the local cab company. I called and mentioned that we’d already called for 10 cabs but that I wished to ensure that one of them was booked specifically in our name. While the dispatcher accepted our name, her approach to the outstanding call for almost a dozen cabs was, to put it mildly, casual; she reticently offered that a couple of taxis would be enroute before too long. Back outside, fellow travellers in the straggling line up were beginning to grumble and express their shared frustration. I mentioned my appeal to the taxi company, and cautioned that the response hadn’t exactly been encouraging. People are generally well intended, orderly and polite, though, and so both the couple at the front of the line and we approached the driver. If he had our name, the cab would be ours; if not, it would go to this other couple. Well, here the evening took another strange turn. The driver didn’t have our name, but he was unwilling to take the couple at the front of the line – even though a number of us assured the driver that we saw them as first in line. My husband and I made our way back toward the end of the now straggling line, which is where we’d wound up after spending time trying to secure cabs. The cabbie pulled away from the curb and slowly drove by the second, third, fourth and even the fifth group of travellers. In fact, it looked as though he was going to head out completely empty before he pulled up in front of my husband and me and announced that he would take us. Feeling awful and relieved at the same time, we turned to our fellow travellers as our luggage was being loaded. Since the driver had a mini van, we called out the name of our hotel and asked if anyone else was headed in the same vicinity. Among our tired and bedraggled fellow travellers, an Aussie couple named Clint and (I think) Tina piped up, and so I urged Tina to just climb in as the fellows hauled luggage and announced to the driver that we’d share the ride. As the then-full cab pulled away from the curb for the last time that evening, the other travellers’ frustration was clearly shifting into something more uncomfortably palpable. It wasn’t until introductions took place inside the cab, with our shared understanding of Australians’ slang use of “sheila” (which I understand has declined in use), that there was any return to anything resembling a sense of vacation or good humour – and we were the fortunate ones! Even as we were on the train from Orlando to Miami, we’d begun considering alternative return travel to Orlando, from which we’d fly home. Given that we had just half a week in Miami, though, the expense of booking flights so close to travel date was impractical, and we nixed the notion of driving. After all, we told ourselves, we knew we’d be able to get a cab from our hotel to the train station, and certainly the return train would be clean since we would be boarding at the starting point of this particular route. Our speculation (hopes) proved to be correct, and we had the bonus, on returning to the Miami station, of renewing our acquaintance with the gracious employee from our arrival evening. The return train travel was uneventful if ultimately again behind schedule before we arrived at our destination. That, and an almost 20 minute delay in receiving luggage off the train, added further expense to the ride we’d booked to our Orlando accommodation, since the driver was ready and waiting at the scheduled time. So, lessons learned. While everything except the image of our fellow travellers waiting with diminishing hope outside the station in Miami was trivial (particularly in relation to train travel elsewhere ’round the globe), and while train travel in general still very much appeals, future travel or connections in this area will likely see us turning to the friendly skies.